Are the Virgin Islands Charter Boat Heaven and Cruiser Hell? As Brits, Mary and I needed full US visas to cruise Alacazam among the USVIs - which we hadn't got, so our cruising was limited to the British Virgin Islands. The first thing about the BVI's you have to accept is that their economy is based on the charter boat sailing industry and hotel-based package holidays. During the season, January to April (we were there in March), it can get crowded - very crowded. After a disappointing overnight sail from St Maarten with light following winds we checked in at Spanish Town on Virgin Gorda before sailing north along Drake's Passage to Gorda Sound. 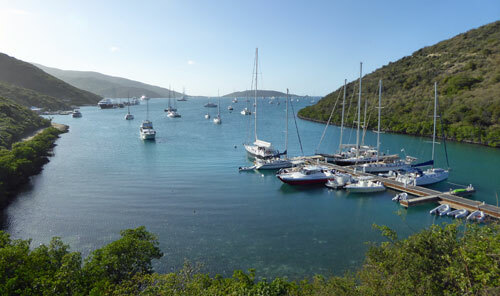 This is a large, protected bay with both anchoring space and a huge number of commercial moorings. We dropped the hook off Vixen Point, a pleasant spot protected from the 25knot easterly winds that sprung up overnight. 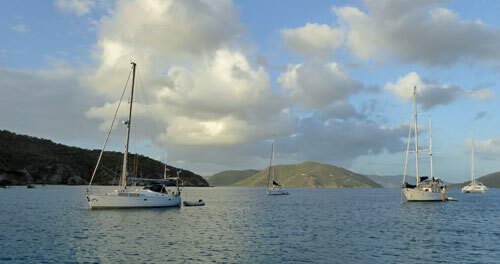 Throughout the BVI's, most of the best anchorages are taken up with moorings, for which you can pay up to $35/night. Professionally skippered charter boats are generally fine, as are those skippered by experienced sailors that have their own boats back home. The problem arises with charter crews that have just one crew member with any experience at all - and this can be minimum - with everyone else aboard being little more than passengers. Such crewed charter boats can be a menace, and there are many that fall into this category. Most charter boats will be catamarans in the 45' to 55' range which swing around their moorings in a much more lively fashion than similarly sized monohulls, so even on a mooring things can still get interesting. The competition for a mooring increases as dusk approaches - if you want to be reasonably sure of finding one vacant, you need to be there by 1400 hours latest. Around sundowner time great entertainment can be had by watching two or more late arrivals racing to pick up the last remaining mooring, provided it's not the one next to you of course. Any bay that has a respectable population of moorings will also have shoreside watering holes to cater for their hungry, thirsty fun-seeking occupants. 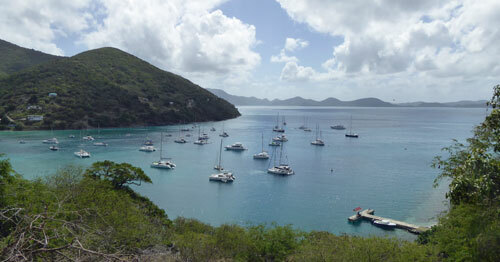 But is it possible to find good, quiet anchorages in the BVI's? YES!! Every island has at least one. Somewhat irreverently named The Fat Virgin by Columbus owing to its resemblance from seaward to a fat woman lying on her back, Virgin Gorda was once the capital of the BVIs. 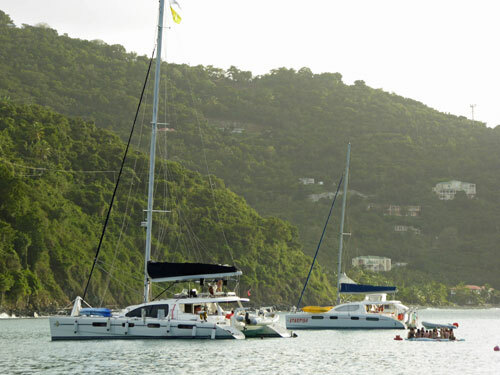 The main anchorage is at Gorda Sound at the northern end of the island. This large protected bay is the home of the Bitter End Yacht Club, which has evolved into a marina and upmarket hotel. There are several other marinas and mooring areas (Biras Creek, Leverick Bay, and Saba Rock) along with a number of anchorages at Robin Bay, Leverick Bay, Gun Creek, Drakes Anchorage, and Vixen Point. Plenty of space to anchor here, and it's well sheltered from the prevailing northeast tradewinds by Prickly Pear Island. A sheltered creek, tucked into the southeastern corner of Gorda Sound with a small marina, a number of moorings and a few spaces to anchor. It was here we discovered the Fat Virgin Cafe. We can heartily recommend their chicken rotis. 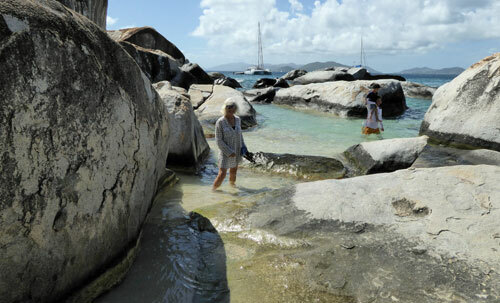 The Baths is an area of huge granite boulders, rock pools and sandy beaches at the southern end of Virgin Gorda. The whole area is a Marine Park. It's a daytime anchorage only, and you must pick up one of the Marine Park moorings. 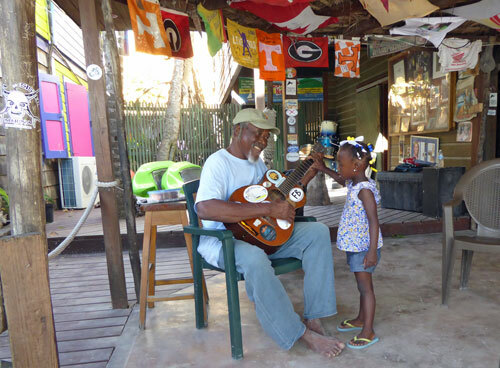 Road Town, Tortola, is the Capital of the BVI's. There's a large fully serviced marina at Road Harbour and several unattractive anchorages. We visited it by bus from Cane Garden Bay, but weren't tempted to take the boat there. We would have liked to have taken Alacazam into the far more attractive Sopers Hole (aka West End) but it was full (and that was before midday), with no available moorings or anchoring space. 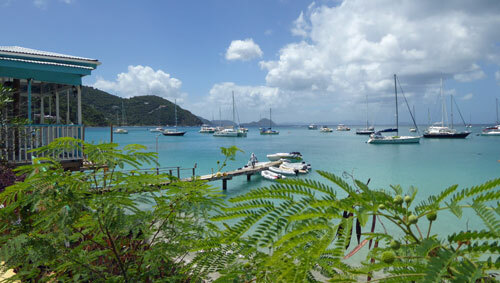 A very attractive tropical bay with some great bars and restaurants ashore. 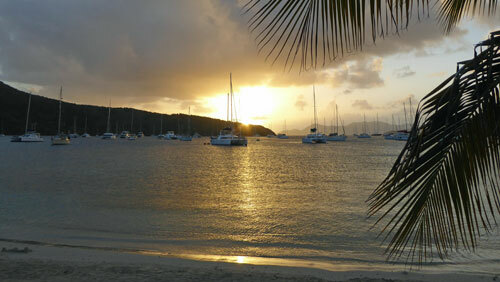 Popular with both holidaymakers and sailors alike, it can be a lively place in the evenings. A daytime anchorage only this one, due to the reefs. Good light is needed to avoid them but once safely anchored it's a peaceful spot - and it's 'out of bounds' to charter boats! Named after a Dutch pirate, this relatively unspoiled hilly island hosts a population of around 200 residents. 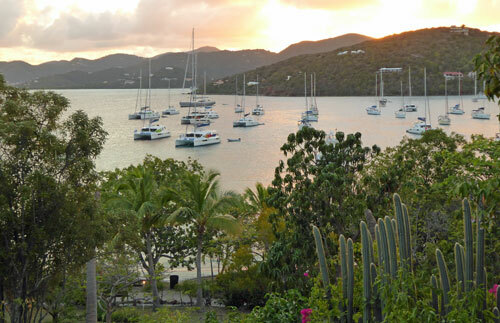 The main anchorage, Great Harbour, where you can check-in to the BVIs, is now largely filled with $30 per night moorings. Ashore there are a number of excellent bars and restaurants, the most famous of which is Foxy's Bar. Foxy was honored in 2009 for ambassadorship at home and around the world, his countless contributions to tourism and undaunted efforts to preserve the heritage of his homeland. Here he entertains a young admirer with his singing - he's something of a poet too. 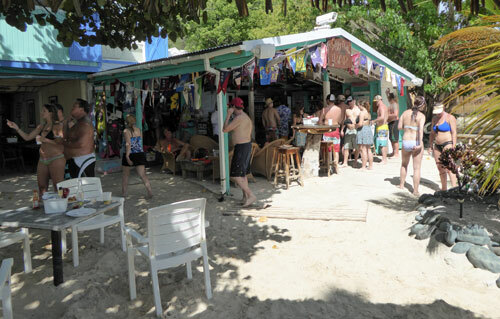 At the east end of the island, Foxy has another lesser known bar, Foxy's Tabboo Bar, which looks over to the anchorage on Little Jost van Dyke. No moorings here, just a quiet, peaceful, exquisite anchorage. Much less crowded than Great Harbour and fewer facilities ashore, Little Harbour is popular with cruisers seeking a little more space to themselves. Fancy a lobster? Sydney's Peace & Love Bar has a deserved reputation as the best lobster restaurant in the BVIs. Similarly packed with moorings and an impressive selection of beach bars and restaurants ashore, a reef-strewn entrance to White Bay calls for some careful navigation. Probably White Bay's claim to fame is as the home of The Soggy Dollar Bar where the famous Painkiller rum cocktail was concocted. The Painkiller is a blend of rum (traditionally Pusser's Rum) with 4 parts pineapple juice, 1 part cream of coconut and 1 part orange juice served on the rocks with a generous amount of fresh nutmeg on top. You have a choice of numbers 2, 3 or 4, which designate the amount of rum. Painkiller #5? Don't even think about it! 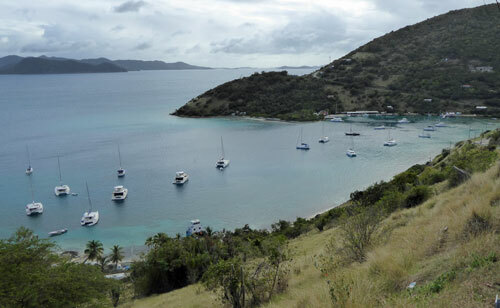 Reputed to be the island upon which Robert Lewis Stevenson based his classic book Treasure Island, Norman Island has some of the best hiking trails in the BVIs. The Bight is a large, very sheltered anchorage with a huge number of moorings. We managed to find a spot to anchor in 12m just outside them. 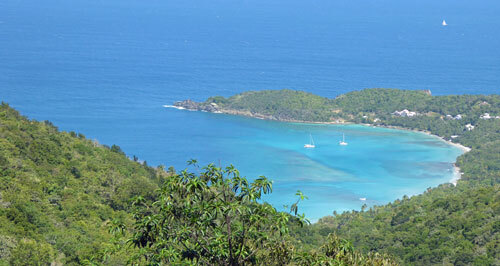 We came across this bay on one of our hikes around the island. Good holding apparently, and it looks idyllic - with no moorings, bars or charter boats. 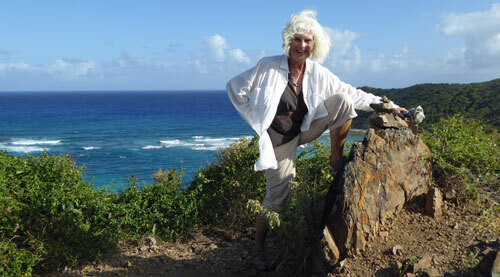 A private island - no trespassing allowed - to the northeast of Tortola. 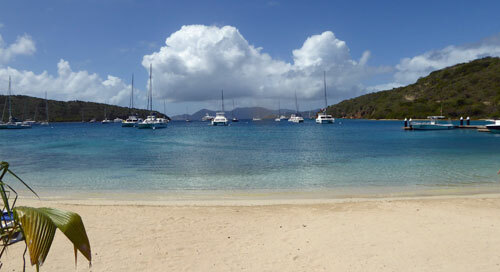 No moorings here - just a quiet secluded anchorage for us cruisers. Hugely popular with charter boats, this tiny island was the home of newlyweds Robb and Rodie White in the 1930s. Robb's best selling book of 1953, Our Virgin Island, chronicles their life together on Marina Cay. So are the BVIs Charter Boat Heaven and Cruiser Hell? In the more crowded bays, it comes close. But if you do your research (and I hope this newsletter helps) you can avoid the hordes of charter boats, where it then gets close to cruiser heaven. But will we go back to the Virgin Islands? Probably, but not without a US visa in our passports. 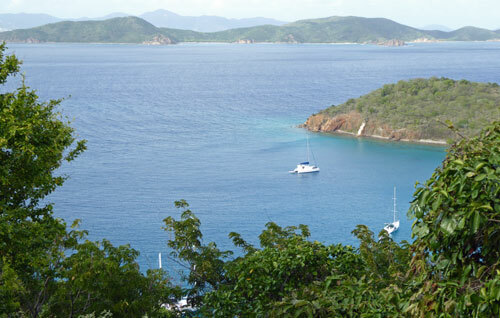 Apparently the moorings in the USVIs are half the price of those in the BVIs and we're told that the hiking trails ashore, particularly those on St John, are spectacular. 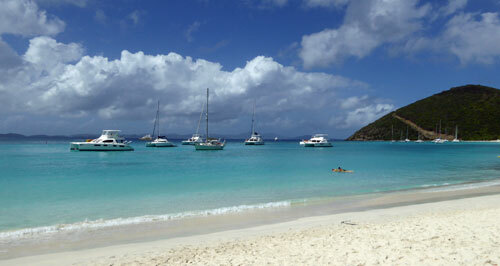 Our favourite BVI island? Jost van Dyke! More 'Likes' Please - We're Just a Few Likes Shy of 1,000!